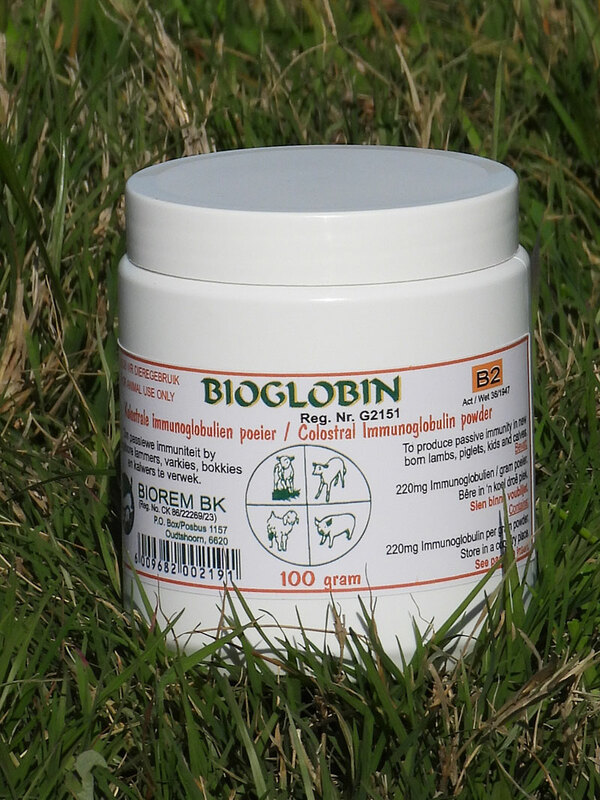 BIOGLOBIN is a stock remedy which increases the passive immunity of calves, lambs and piglets, when administered within the first 6 hours after birth: to those who did not receive natural Colostrum, or not enough, or where the Colostrum is of a low standard. A 500ml container with 100g. 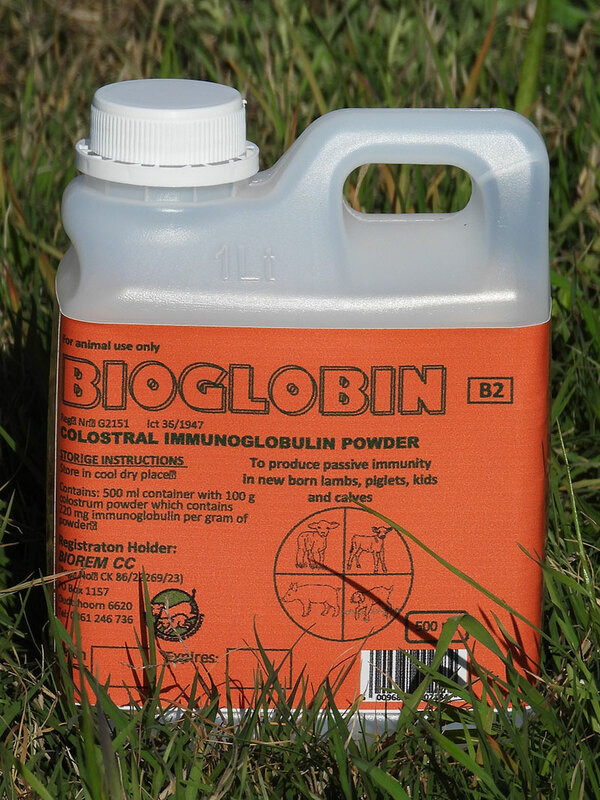 BIOGLOBIN powder which has to be mixed with 400ml warm water (37°C). Repeat hourly within the first 6 hours when no other colostrum has been received. More technical detail is available on request. In an experiment to determine what the effect is when newborn lambs lambs are treated with BIOGLOBIN, the risk of mortalities were reduced highly significant. The mortality rate in the treated group, 14 days post treatment, was 0, as to the 16.67% of the untreated control group. A reducing of 66% in the mortality rate was found when treated with BIOGLOBIN in comparison to the untreated control group. The piglets received a dose of 2 x 5ml BIOGLOBIN within the first 8 hours after birth. BIOGLOBIN has an antagonistic reaction against any micro-organisms in the abomasum when dosed within the first few hours It is therefor not recommend to dose BIOGLOBIN and BIOSIN simultaneously. Lambs treated with l0ml BIOSIN on the 2nd or 3rd day, had an average of 1kg advantage in mass after 60 days over the untreated control group. This experiment has been repeated various times with similar results. The simultaneously administration of BIOSIN and BIOGLOBIN resulted in a 28% average mass increase in comparison with the untreated control group. Diarrhoea cases have been reduced significantly. Day 1: 5ml BIOGLOBIN hourly within the first 6 hours after birth. Research has shown that calf mortalities are 6.1% in cows and 11.3% in heifers, from diagnoses of pregnancy up to weaning. 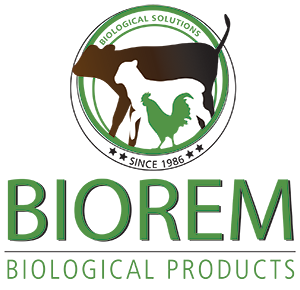 Some of the most important reasons can be attributed to the quality of Colostrum received. Calves of heifers and sick cows have to receive additional Colostrum.